Today on the blog I have a fab giveaway for all my fellow crafters! I've been sent a hard copy (on disc) of this brilliant brand new eBook 'Harris Tweed Appliqué for Beginners', by Chris Hammacott to giveaway. The eBook is worth £17 and produced by Vive Books. If you love sewing then this book is definitely for you - its full of fun, quirky and stylish craft ideas of how to use beautiful Harris Tweed for gorgeous items around your home. Create hand or machine appliqué with ‘Harris Tweed’ – in easy steps! Chris Hammacott leads you through plump cushions, quirky tea cosies, a table runner and a wall-hanging, all given the rugged but cosy personality of ‘Harris Tweed’. Designs are inspired by Chris’s croft life on the Isle of Lewis; and her sheep, chickens, cats and pugs.The Kindle cover has reverse appliqué sheep.A scarecrow with tweed hat decorates a denim jacket; three-dimensional flowers enhance a sweater. Follow the guidelines and techniques, and watch the author demonstrating on the video clips.Whether you are a complete beginner or a more advanced student, Chris will convince you of the wonderful qualities of ‘Harris Tweed’ for appliqué. The cutest Kindle cover you ever did see? Chris Hammacott has been writing about, teaching, and designing textiles for over 30 years. Trained as a weaver, she has taught City & Guilds from her own distance learning centre. Chris was expelled from her first needlecraft lesson at school and since that experience has vowed to make textiles fun! Her motto is:‘if you like it, do it some more.’ Chris’s designs have appeared in quilting magazines in Australia, Europe, the USA and UK. She writes two regular magazine columns. In 2012, with her husband Andrew, she moved to a small croft in the Outer Hebrides. In her workshop there, Chris teaches all aspects of ‘Harris Tweed’, from spinning and natural dyeing to designing items made from the wonder cloth. Andrew weaves ‘Harris Tweed’ in the old weaving shed. I love this beautiful bird design tea cosy: the perfect adornment for any tea pot! How about this fun chicken table runner? The ideal accessory for any country style dining table. If you fancy getting your hands on this gorgeous eBook disc then look no further - there's plenty of ways to enter, just use the Gleam App below. 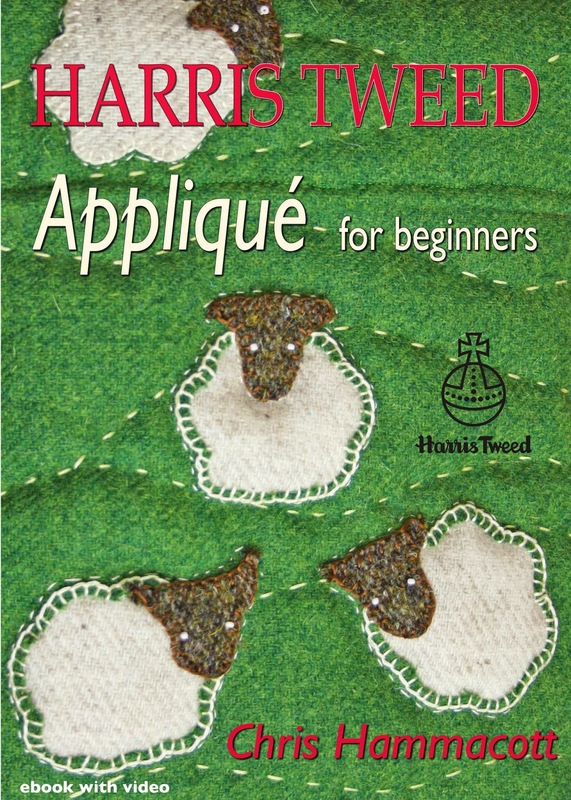 One hard copy (disc) of Harris Tweed Appliqué for Beginners by Chris Hammacott. Thanks for this lovely review Mrs Bishop. So glad you liked Harris Tweed Applique. Anyone wanting to buy Harris Tweed might like to know that Harris Tweed Hebrides has some great discounts on offer this weekend!